Headed out for a bit of camping? If you’re going camping by yourself, you likely haven’t paid much thought to where you are going to lay your head at night. However, if you’re traveling with a large group (or particularly a family), you need to put some extra consideration into how you will all sleep. A 6-person tent offers all the comfort of a traditional tent – and then some. These roomy tents are ideal for larger groups, or even campers seeking just a little more room to move around at night. Consider the Coleman Instant Cabin 6 Person Tent, one of the best tents on the market, as you are making this important purchasing decision. This portable tent is roomy enough to fit two queen-sized airbeds (or the equivalent, if you’re headed out for some backcountry camping). Easy to set up and tear down, it can be assembled in fewer than five minutes. It includes a built-in storage compartment so that it is easy to store your gear, like your cell phone or flashlight, without having to worry about them becoming wet with dew or destroyed by the elements. Another nice feature? 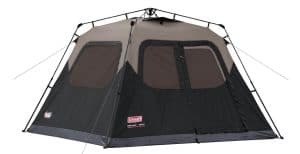 This tent is made out of unique materials that are backed by Climate Tec and come with Coleman’s exclusive Dark Room Technology. This material blocks a majority of sunlight from entering the tent, allowing you to sleep in longer and more comfortably. This is a nice feature, particularly if you are camping with small children who need the rest after a long day of hiking. The Coleman Instant cabin actually comes with multiple sizes, allowing you to customize your tent size depending on your camping group. It can be purchased as a six-person, four-person, or even a ten-person tent. The ten-person tent has an additional dark room, allowing for a separate area in which to sleep or stash your gear. 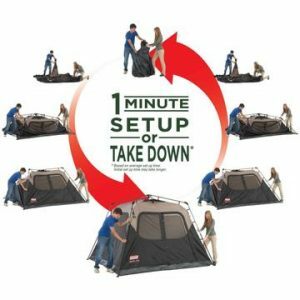 The six-person tent, one of the most popular sizes, measures 10 by 9 feet with a 6-foot center height. Tall campers, rejoice – no more slouching in the center of your tent for you! All models, regardless of the size, are designed with the superior WeatherTec technology in mind. This technology has patented welded floors as well as inverted seams, helping to keep you dry even in the most abysmal of conditions. All seams are taped so that no moisture can make its way inside the tent and its walls are made out of rugged Polyguard double-thick fabric. This not only keeps you protected from the elements but also increases the likelihood that this tent will last you for many years down the road – an important consideration to make if you are interested in using this tent for multiple seasons in a row. Finally, the tent comes with an integrated vented rainfly. This is nice for a variety of reasons. First, because the rainfly is included, there’s no additional assembly or potential problems related to tangled or ripped fabric to worry about. It also provides added ventilation, giving you plenty of airflow to eliminate musty odors or uncomfortable interior temperatures. Consider these pros and cons when making your purchasing decision. The Coleman Instant Cabin is one of the best on the market, with benefits that far outweigh the disadvantages. Customers rave about the Coleman Instant Cabin 6 person tent. Although it does not include an additional rainfly, very few campers report needing one. The tent is fully taped and because the tent is made out of thick, durable material, it is difficult to tear or damage. A rainfly is only a consideration in a heavy downpour, and the built-in rainfly that the Instant Cabin contains is already enough protection against these elements as it is. Another nice feature of this product is its easy portability. Regardless of whether you are camping in the backwoods or out of your car, you want a tent that will adapt to meet your needs. The Instant Cabin packs down easily into an expandable duffel bag (included when you purchase the tent) that allows it to be transported easily between your campsite and your home – no matter how far away your campsite is from your vehicle. If you’re looking for the best 6-person tent which will provide you with maximum comfort and space to enjoy a good night’s sleep, look no more. The Coleman Instant Cabin, probably one of the best six-person tents, offers that and then some, making it an ideal choice for a family headed out to enjoy the great outdoors.